The statue of the pharaoh of Ancient Egypt Ramses II, which is more than 3000 years old, will be moved to 400 m. The operation began on Thursday morning near the Giza pyramids complex in the suburbs of Cairo. The structure was loaded onto special trailers and fixed. Ramses is transported in an upright position along a flat road surrounded by solemn music (a hymn, military marches), equestrian riders and high-ranking observers and journalists. This is the second transfer of the 11-meter statue in the last 15 years. In 2006, the pharaoh was transported to the area of ​​the Giza complex from the square at the Central Railway Station of Cairo, where the monument stood for more than 50 years. Then the decision on the transfer was made with a view to preserving this priceless artifact – noise, dust and vibration from the movement of the trains caused irreparable damage to the monument. 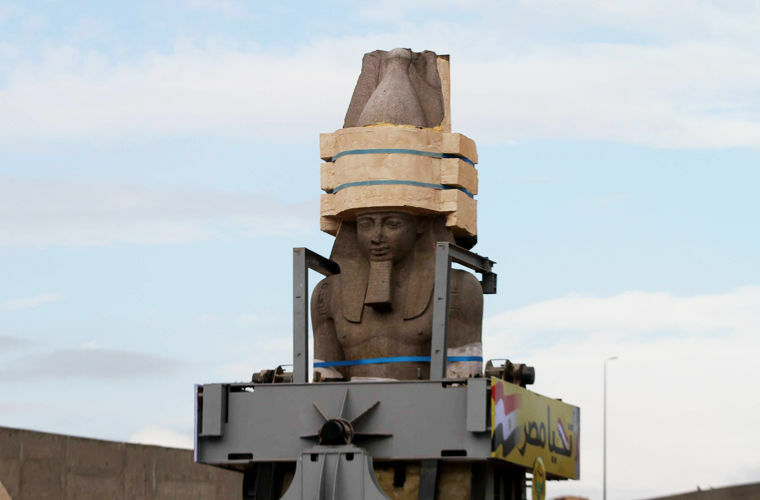 This time the statue is transported only 400 meters to install it at the lobby of the new Big Egyptian Museum. It is expected that the giant Ramesses II will majestically greet visitors to the museum at the entrance. Opening of the first stage of the Great Egyptian Museum is planned for 2018. Pharaoh Ramses II, often called the “pharaoh of miracles”, “king-sun” and “king of kings”, turned Egypt into a great power thanks to the conquest and development of new territories, construction and irrigation. It is believed that Pharaoh lived more than a hundred years, of which 67 ruled Egypt, he had more than one hundred children from 60 wives.